This is a re-post for the Fourth of July. My oldest son helps me make this American Flag cake every year. It's a delicious lemony cake with light sweet homemade frosting and lots and lots of fresh berries. Big enough to feed a crowd! 1. Cake: Heat oven to 350. Coat two 15 x 10-inch jelly roll pans* with nonstick cooking spray. Pour lemon juice into 4-cup measuring cup; add enough water to equal 2 2/3 cups. 2. In large bowl, beat cake mixes, egg whites, lemon zest, juice-water mixture, and lemon extract to blend, about 3 minutes. Divide evenly between two pans. Smooth tops. 2a. Let the helpers get a few licks in. 3. Bake at 350 until cake springs back when lightly touched, about 20 minutes. Let cool on wire racks 10 minutes. Invert cakes onto trays and cool to room temperature. If making ahead, wrap layers when cool in plastic wrap; refrigerate for several days. Bring to room temperature before proceeding. 4. Frosting: Beat butter and shortening in large bowl 1 to 2 minutes until fluffy. Add confectioners' sugar, milk, and lemon juice. Continue beating on low until well blended and good spreading consistency, adding more milk if needed. 5. Decoration: Place one layer on serving tray. Reserve 1 Cup of frosting for piping. Frost layer, top with second layer, frost top and sides. 6. Mark off field for "stars" with toothpicks (approx. 6" across and 4.5" down) and fill in with blueberries. Place seven red "stripes" of raspberries on cake, leaving equal spacing for 6 white "stripes" between the rows of raspberries. 7. Place reserved frosting in pastry bag with star tip. Outline cake with piped stars, and fill in white stripes with piped stars. Last Christmas my mom gave me a present that I love - my grandmother's pastry decorating tool. I've no idea how old it is (very old), but it works well and I used it for the first time on this cake. 8. Refrigerate uncovered to set frosting, then loosely cover with foil and refrigerate until ready to serve. 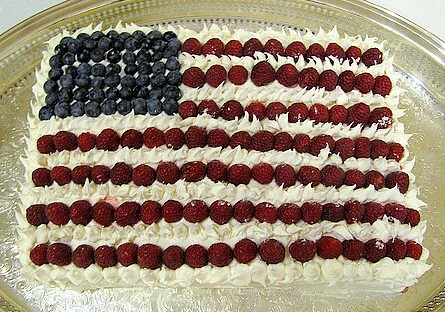 Our Flag Cake. Don't count the stars please. Bear was eating them while Shark Boy was counting blueberries into the bowl, and we ended up just filling in the space and there might be like 70 states. But they are all yummy! Now that's a tribute! Wishing you and yours a wonderful fourth of July! saving that recipe. 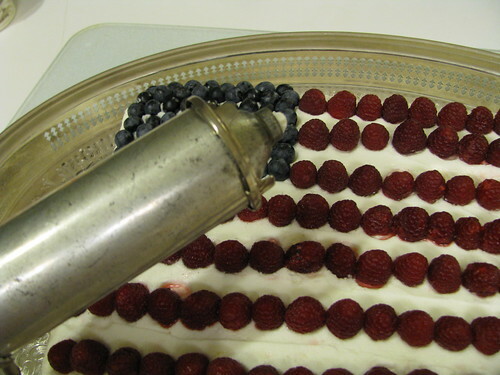 my anniversary is on flag day, the daughter's birthday is on july 1. this cake recipe will come in handy. and it looks DEE-lish-ious!! ummm and yeah. 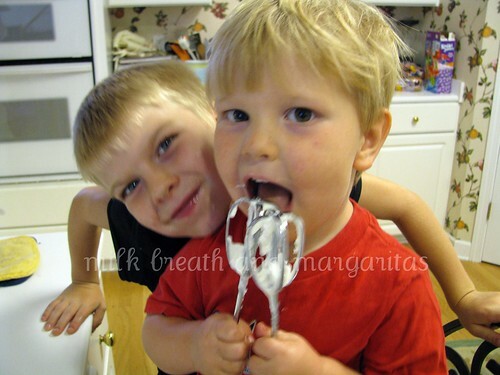 a good recipe for margaritas… that's always welcome!